2010 was a big year for Opera’s mobile browser, Opera Mini. The browser’s iPhone app was approved, saw one million downloads in the first day and since the mobile browser has been growing like gangbusters. Today, Opera released its state of the mobile report showing that Opera finished the year off with additional growth. In December 2010, Opera Mini had over 85.5 million users, a 6.8% increase from November 2010 and an 84.7% increase in unique users since December 2009. Opera Mini users viewed over 46.7 billion pages in December 2010, which is a 4.6% percent increase since November, and a 125.5% increase in page views since December 2009. In December 2010, Opera Mini users generated over 706 million MB of data for operators worldwide. Since November, the data consumed went up by 4.3%. Data in Opera Mini is compressed up to 90%. If this data were uncompressed, Opera Mini users would have viewed over 6.5 petabytes of data in December. With the holiday shopping season in full swing in December, Opera took a look at traffic to e-commerce giant Amazon, with percentage of Opera Mini users who accessed Amazon (per month) went from 3.8% in January 2010 to 7.4% in December. 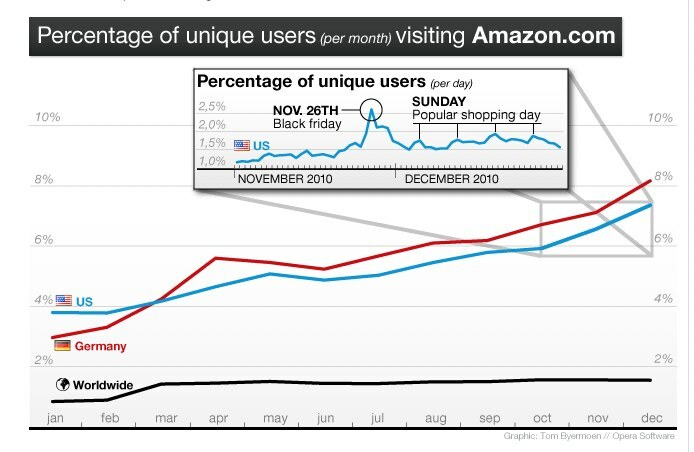 Shoppers in the U.S. and Germany doubled their number of page views to Amazon towards the end of the year, as compared to the start of 2010, as mobile shopping heated up. Opera also delved into usage in ten countries in Africa (South Africa, Nigeria, Egypt, Kenya, Ghana, Sudan, Libya, Tanzania, Zimbabwe and Namibia), with page views in these countries increasing by 365%, unique users up 176% and data transferred up by 331%. Sudan and Zimbabwe lead the top 10 countries of the region in terms of page-view growth (4908.2 % and 2321.6 %, respectively). And in the top 10 African countries, Facebook and Google vied for the website with the most visits. In 6 out of the top 10 countries, Facebook was number one. In the remaining 4 countries, Google was number one. YouTube, Yahoo, and Wikipedia were also highly visited in these countries.